During the 12th century, a fishing village arose out of Amsterdam’s early swamplands. At some point, someone discovered that the IJ inlet provided access to rich fishing waters. Shortly after, eager fisherman began building huts on small islands around the area. The first dams were built during this time. The region remained sparsely populated until 1275 when the Count of Holland granted free trade rights in Holland and Zeeland. This is generally accepted as the day Amsterdam was founded. Trade between Germany and Baltic port towns began and Amsterdam steadily grew. During the 1300’s, beer became the major source of income. Tolls were placed on the import and export of beer. Then in late 16th century after Antwerp was invaded by Spain, Amsterdam took on a new role in the region. Merchants and craftsmen fled to Amsterdam taking with them the diamond industry in addition to their merchant skills. The 17th century marked the beginning of Amsterdam’s Golden Age, which endured for over 70 years. Out of this came the Verenizde Oostindische Campangnie (V.O.C.) otherwise known as the United East India Company. The V.O.C. was granted a monopoly on trade in the east. Wealth flowed into Amsterdam in the city exploded. Luxurious mansions were built along with churches, and an enhanced canal system. Architects and artists flourished. When the French invaded the United Provinces and in 1672, the economic boom came to a screeching halt. The Dutch call this the Year of Disaster. War with France, England, and later with Spain during the War of Spanish Succession devastated the region. Dutch wealth that remained was channeled elsewhere into safer investments. Amsterdam fell into a downward spin for many years. By 1791 the United East India Company went out of business. In 1794, French invaded Holland and captured Amsterdam. Napoleon appointed a monarch. French occupancy was short lived. The Dutch reclaimed Amsterdam and inaugurated a new monarch, William of Orange, in 1815. In 1839, Amsterdam’s first railway was opened. During Europe’s industrial revolution, Amsterdam’s canal links to the North Sea and Rhine River coupled with the railway sparked an economic boom. Amsterdam became known for its diamond industry. Germany invaded Amsterdam on May 10th 1940. Amsterdam put up little resistance. As with most European countries, Hitler gained a following in the Netherlands. However, there was unrest over Nazi treatment of Jews. On May 5th 1945 the Allied forces liberated the Netherlands. Today Amsterdam is a bustling village city with a multi-cultural population. 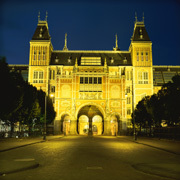 Amsterdam is recognized for it’s liberal views, vibrant nightlife, unique merchant shops, and world-class museums. Wealth and prosperity has been restored to Amsterdam and all it’s historic charm.